Viridea SOHO @ Medini by UM Land: Low Quantum investment <RM1 mil (Foreigner Eligible). No Capital Gain Tax! What’s More to Invest in Medini?!! Chat with Us to Enjoy Attractive VVIP Prices and Discounts! 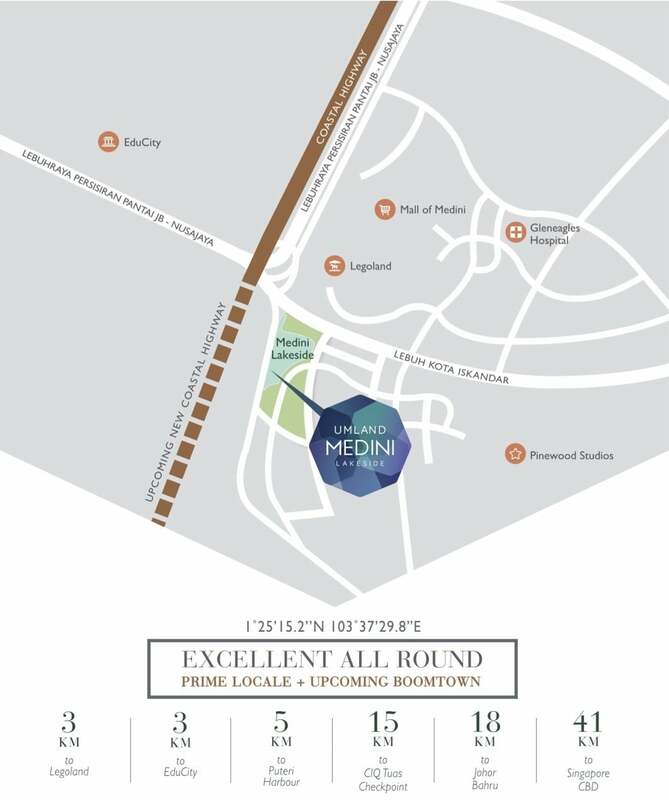 Viridea @ Medini Lakeside is a 8.2-acre mixed development located at Medini, an area which has been earmarked as the central business district of Nusajaya (Flagship B), one of Iskandar Malaysia’s five flagship zones. UMLAND Medini Lakeside that located in Medini Iskandar Development Zone. It comprises of entertainment hub, residences and Signature SOHO. It is a single tower of 24-storey with total of 120 SOHO units. There will be 8 units per level with 2 passenger lift and 1 service lift. Facilities like gymnasium, swimming pool, pool deck, children’s playground, sauna, sky gardens, barbecue areas etc will be provided. The whole development of UMLAND Medini Lakeside comprises four phases which include recreation lake and Central Green park, phase one is under construction now. The masterplan of UMCITY Medini Lakeside is designed to be a showcase of residential, hospitality, business and retail components. Located in Medini’s special development zone, UMCITY offers advantage for business owners with some special incentives such as corporate tax exemptions, unrestricted recruitment of foreign staffs. UMLand is an established property developer in Malaysia. UMLand operates two development divisions, namely the Township and Niche Divisions. The Group has over 1,800 acres of undeveloped land in both Township and Niche Divisions. The Township Division has three mixed township developments located in high growth areas of Malaysia. The townships of Bandar Seri Alam and Taman Seri Austin are strategically located within Iskandar Malaysia, Johor whilst Bandar Seri Putra is situated in Selangor and another upcoming township located in Pasir Gudang which will be called Seri Alam 2. The Niche Division has to date completed four residential serviced residences and condominiums — Seri Bukit Ceylon at Jalan Bukit Ceylon, Suasana Sentral Loft at KL Sentral, Suasana Bangsar in the suburb of Bangsar and Suasana Bukit Ceylon, which located in the enclave of Bukit Ceylon within KL city centre. The Division is now developing a project in the heart of Johor CBD called Suasana which comprises of service residence, hotel and retail components and also Somerset Puteri Harbour, a luxurious boutique serviced residences. Among future developments are, a serviced residence at Jalan Mayang within KLCC vicinity called Star Residences, a multi-phased mixed development located at the gateway of Medini called Medini Lakeside and another Puteri Harbour waterfront project in Nusajaya, Iskandar Malaysia called The Waves @ Puteri Harbour. Spill over effects from property boom in Singapore Jurong District. Viridea SOHO Medini Lakeside is 30 minutes away from Senai International Airport, 45 minutes to Changi International Airport, 7 minutes to Port of Tanjung Pelepas and 45 minutes to Port of Pasir Gudang. Newly completed Coastal Highway Southern Link (CHSL) will reduced the travelling time from Medini to CIQ Tby 10KM. Coastal Highway will also reduce travelling time to Johor Bahru city. Amenities can be reached within UMCITY development once completed in near future. There are supermarkets like Mydin and Jaya Grocer in nearby area. There are also choices of restaurant and cafe like Starbucks in Medini and Puteri Harbour areas. Gleneagles Hospital is minutes drive from UMCITY as well. 8 mins walking distance to future Commercial Mall – UMCITY. 1. Booking S$2000 cheque payable to “Huttons International Pte Ltd” / RM10 K Direct to UM Land account in Malaysia.